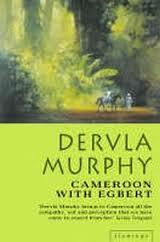 Cameroon With Egbert must be among my favourite Dervla Murphy books. Despite my oft-repeated preference for her later, more politicised titles, I really enjoyed the story of Murphies' African adventure. For clarity's sake, let me quickly explain that the plural in the previous sentence is due to the author being accompanied by Rachel, her daughter (this time - eighteen) and the mysterious Egbert completing the roll call of the little team is their pack horse, acquired on the way. On pages of the book, Cameroon appears a vibrant and friendly country, but no country described by Dervla Murphy ever appears otherwise. I wonder, is it the case of the beauty in the eye of the beholder? Please do not misunderstand me - I'm not trying to accuse Cameroon of unloveliness. I'm just under the impression that some writers, like some photographers, are able to beautify the object of their work, no matter what it looks like to ordinary mortals. Would I see Cameroon as Dervla saw it? I doubt it. I'm a much gloomier, more cynical person (and this remark should persuade you that I'm not bemoaning any faults of Cameroon, but rather inadequacy of my own sight). The book contains an unexpected bonus. In 1986, volcanic lake Nyos exploded with toxic gas (mainly carbon dioxide), killing almost two thousand people and countless animals. Dervla and Rachel's wanderings took them to the site of the tragedy eight months after the event. Before (unwittingly) getting in trouble with local authorities, they managed to witness the obliterated villages and the lake itself. The account of the spooky atmosphere around the tragedy-stricken area is powerful and Dervla's encounters with the survivors are truly heartbreaking. Disasters are far more shattering when seen up close rather than through the safe (but sterile) medium of statistics and press reports. I'm still wondering if there is another travel writer quite as unique as Dervla Murphy. I'm quite certain that never, in no genre, have I stumbled across an author with integrity as tremendous as hers. One cannot suppress a sad sigh... Is it just me, or the world is really much poorer with so few people of her kind around?